← So you think you have the Messiest Desk in the U.S.? Last weekend I had the privilege of spending my time at the Direct Selling Women’s Alliance (DSWA) Celebration Conference. This was my first experience working with DSWA: what a delight! After a hectic and busy week at my day-job (I am the executive director of a local non-profit, in addition to owning and managing Jamie Raquel, Inc.) the prospect of driving 3.5 hours to Los Angeles and battling L.A. traffic did not sound appealing. But, I had been invited to introduce Jamie Raquel File Totes to the women of DSWA and I was looking forward to this event. Lately, I’ve been on this kick of preaching about being a “yes” girl. Have you seen the Jim Carrey film Yes Man? If you haven’t, I highly recommend it. Not only did I find it hilarious, I was actually inspired. I’ll give you a quick synopsis: Jim Carrey’s character goes from being a closed, negative, no man to being an open, optimistic, yes man. Throughout the film, the action of saying yes to everything transforms his life into an adventure. Now, I know we girls keep getting the message “don’t be afraid to say no.” We often strap ourselves down with too many obligations by saying yes to all requests and then life becomes no fun. I get that. I don’t want my life to start feeling like one giant “have to” instead of days filled with “want to”. Believe me, I’ve had days like that. Lately, I’ve been approaching requests and invitations with Jim Carrey’s movie playing in the back of my mind. If I say no … I will never know. If I say yes … who might I meet? What might I see? What might I learn? What doors might open? It happens time and time again. I’m invited to attend a luncheon, a meeting, a musical, a party, a DSWA Conference. I say yes. Then when it’s time to get my busy, tired self to the appointment, I drag. Why did I say yes? You know what?…I’m not going. They’ll understand. I’m swamped. I’m running behind. I’m tired. It’s no girl vs. yes girl. You know how this movie ends, don’t you? The ladies sitting at my table at the luncheon were too fun, not to mention the dessert was out-of-this-world delicious; the meeting armed me with important information to take back to my board of directors so I don’t look like a schlump the next time the issue is up for discussion; I laughed, I cried, and am still singing songs in my head after the musical is over; the hostess and guest-of-honor were so grateful that we took the time to attend their party and I had fun watching her open her gifts; and the ladies at the DSWA Conference were the BEST! They were professional, energetic, warm, supportive and inspiring. 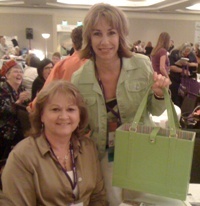 The speakers were educational and entertaining and … Jamie Raquel File Totes were a hit! This entry was posted in Direct Selling, Friendship, Jamie Raquel File Tote, Motivation, Networking, Portable File Tote, Uncategorized and tagged Business, Direct Selling, Friendship, Motivation, Networking, Working Women. Bookmark the permalink.